See our stunning range of kids bedroom sets. 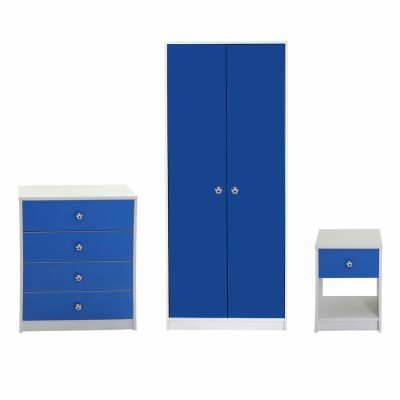 All sets come as a three piece set including a bedside cabinet, a chest of drawers and a kids wardrobe. 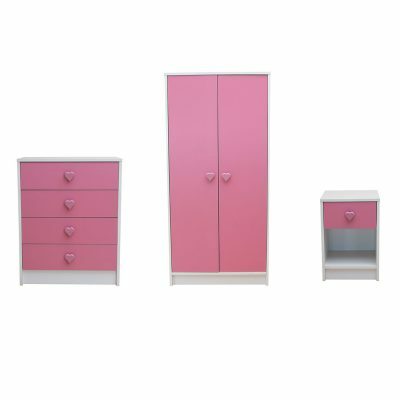 Available in white, pink, red and blue we have the colour and style options to suit your kids bedroom. The kids bedroom sets include a bedside cabinet featuring one good sized drawer and a storage area underneath. The chest of drawers features 4 deep drawers, capable of holding up to 7kg each. The wardrobe features one hanging rail of unobstructed hanging space and is designed with your children in mind, meaning its a little smaller then a standard wardrobe meaning kids can access their own clothes.